‘서울 봉은사 목조석가여래삼불좌상(서울 奉恩寺木造釋迦如來三佛坐像)’은 조선 후기 1651년 조각승 승일(勝一)이 수(首)조각승으로 9명의 보조 조각승들을 이끌고 제작한 상이다. 1765년의 개금발원문(改金發願文)을 통해 1689년에 화재로 본존 석가상은 소실되어 새로 조성했음을 알 수 있다. 승일이 제작한 본존 석가상은 좌우협시상에 비해 30cm 정도 크고, 변형식 편단우견(偏袒右肩)으로 법의를 걸치고 항마촉지인(降魔觸地印)을 결한 모습이어서 조형적인 면에서 구별되나 착의와 수인(手印) 등은 17세기 중엽의 불상 양식을 따르고 있음을 알 수 있다. 본존 석가불상은 좌우의 아미타불, 약사불과는 다른 조각가에 의해 제작되었지만, 조각적으로 우수하고 발원문과 개금문을 통해서 삼세불의 봉안과 개금에 참여했던 시주자들, 조각을 담당했던 조각승들을 알 수 있으므로 조선 후기 17세기 중후반 불교조각을 이해하는 데 중요한 작품으로 평가된다. 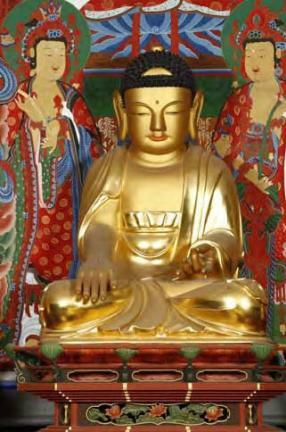 The Wooden Seated Sakyamuni Buddha Triad of Bongeunsa Temple in Seoul was completed in 1651 by a group of monk-sculptors led by Seungil. 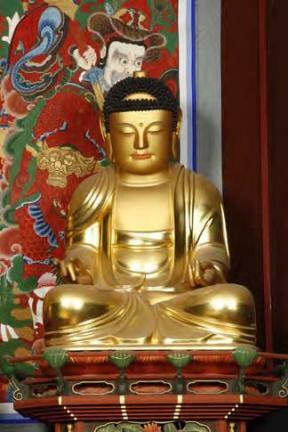 A prayer written at the time of the 1765 re-gilding project reveals that the original Shakyamuni statue of the triad was destroyed by fire in 1689. 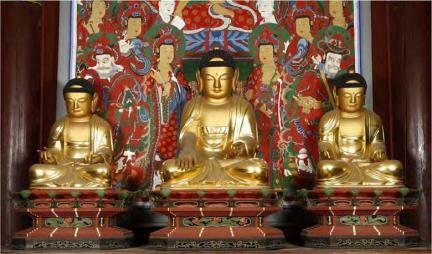 The principle Buddha, carved by Seungil, is 30 centimeters taller than the two acolytes standing at his sides. He is wearing a robe draped over the left shoulder, leaving the right shoulder and the right part of the chest bare, and forms — with his right hand hanging down and his left hand resting on top of the knee — the mudra representing the expulsion of evil. 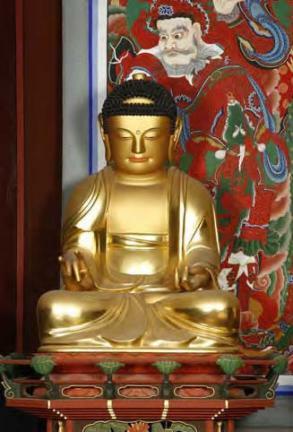 The style of the robe and the symbolic hand gesture show the influence of Buddhist sculpture of the mid-seventeenth century, making the work a fine source of knowledge on Korean Buddhist sculpture of the late Joseon period.